NucView®488 and RedDot™2 Apoptosis/Necrosis Assay Kit contains NucView®488 Caspase-3 Substrate for detection of caspase-3/7 activity. The far-red dead-cell stain RedDot™2 is included for staining necrotic and late apoptotic cells that have compromised plasma membrane integrity. How stable are NucView® Caspase-3 Substrates? The substrates are very stable. Some users have reported performing time course assays with NucView® 488 Caspase-3 Substrate for 4-5 days. When should I add the NucView® Caspase-3 Substrate to my cells? NucView® Caspase-3 Substrates can be added to the cells at the start of the experiment or at the end. A major advantage of NucView® Caspase-3 Substrates compared to other apoptosis assays is that it can be used to monitor capase-3 activity in real time. Are NucView® Caspase-3 Substrates compatible with flow cytometry or microplate readers? Yes. NucView® Caspase-3 Substrates are compatible with flow cytometers and other instruments with the appropriate excitation and emission settings. NucView®488 and RedDot™ Apoptosis/Necrosis Assay Kit contains NucView®488 Caspase-3 Substrate for detection of caspase-3/7 activity. 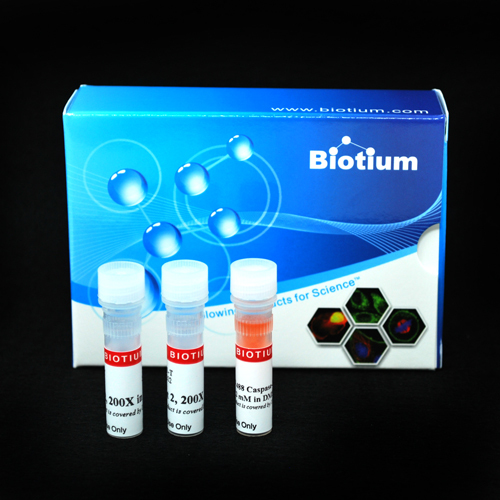 The far-red dead-cell stain RedDot™ is included for staining necrotic and late apoptotic cells that have compromised plasma membrane integrity. This kit provides a convenient tool for profiling apoptotic and necrotic cell populations by fluorescence microscopy or flow cytometry. In contrast to other fluorogenic caspase substrates or fluorescent caspase inhibitor based (FLICA) assays, NucView®488 Caspase-3 Substrate can be used to detect caspase-3/7 activity within individual intact cells without inhibiting apoptosis progression. The substrate consists of a fluorogenic DNA dye coupled to the caspase-3/7 DEVD recognition sequence. The substrate, which is initially non-fluorescent, penetrates the plasma membrane and enters the cytoplasm. In apoptotic cells, caspase-3/7 cleaves the substrate, releasing the high-affinity DNA dye, which migrates to the cell nucleus and stains DNA with bright green fluorescence. Thus, NucView®488 Caspase-3 Substrate allows detection caspase-3/7 activity and visualization of morphological changes in the nucleus during apoptosis. RedDot™ is a cell membrane-impermeable, far-red dye with high selectivity for membrane compromised or dead cells. RedDot™ has far-red emission at 695 nm for detection in the Cy® channel, well-separated from the green fluorescence of NucView®488. The excitation maximum of RedDot™ is 665 nm, but it can be efficiently excited by wavelengths from 488 to 647 nm, and therefore can be used with the 488 nm flow cytometry laser line. Note: while NucView®488 staining is formaldehyde-fixable and compatible with subsequent immunostaining, fixation after staining with RedDot™ is not recommended because it can result in increased background staining of healthy cells. See our full selection of NucView® substrates and kits. NucView® enzyme substrate technology is covered by U.S. patents. Cy5 is a registered trademark of GE Healthcare. Cen, et al. DEVD-NucView488: a novel class of enzyme substrates for real-time detection of caspase-3 activity in live cells. The FASEB Journal published online February 8, 2008. Annexin V fluorescent conjugates can be used to detect apoptotic cells. Annexin V is available conjugated to a wide variety of dyes. Annexin V fluorescent conjugates can be used to detect apoptotic cells. Annexin V is available labeled with our superior near-IR fluorescent dyes. The CF® dye TUNEL Assay Apoptosis Detection Kit employs dUTP conjugated to the exceptionally bright and photostable fluorescent dyes, for single step fluorescent TUNEL labeling of fixed cells or tissues for analysis by fluorescence microscopy or flow cytometry. NucView® 405 Caspase-3 Substrate, 1 mM in DMSO, provides a convenient tool for detecting apoptosis in intact cells based on caspase-3/7 activity using either confocal microscopy or flow cytometry. NucView® 530 Caspase-3 Substrate, 1 mM in DMSO, provides a convenient tool for detecting apoptosis in intact cells based on caspase-3/7 activity using either confocal microscopy or flow cytometry.